May 3, 2016, 10:22 AM · In an effort to promote the coverage of live violin performance, Violinist.com each week presents links to reviews of notable concerts and recitals around the world. 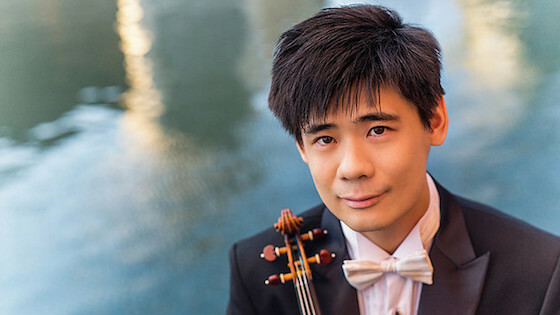 Angelo Xiang Yu performed the Bruch with the Charlotte Symphony Orchestra. Charlotte Observer: "Yu matches a velvety tone to a contemplative style rare in a musician of 27. Many soloists use this concerto to throw off sparks; Yu was determined to place it among the greats, along the Brahms-Beethoven axis, and played with meditative intensity. That feeling carried over into his encore, a movement from Bach’s Sonata No. 1 during which neither he nor the audience seemed to draw breath." Angelo Xiang Yu. Photo by Kate Lemmon. Christoph Koncz performed the Korngold with the Portland Symphony Orchestra. Portland Press Herald: "Koncz, who has a slight film association as well – you can see him, at 9 years old, playing the child prodigy Kaspar Weiss in “The Red Violin” – moved easily through (the Korngold's) virtuosic passagework, but kept the emphasis on musicality rather than showiness." Augustin Hadelich performed the Sibelius with the Bournemouth Symphony Orchestra. The News: "...the abiding memory is of Augustin Hadelich’s mastery in the Sibelius violin concerto. From the rapt opening, both solo and orchestral sonorities were precisely judged, and when the pace quickened Hadelich was electrifying. He showed youthful bravura but was mature to his fingertips in the way he adapted his richness of tone, paring it down for the most exquisite of nuances. Sergej Krylov performed the Tchaikovsky with the Cincinnati Symphony Orchestra. Cincinnati Enquirer: "It was the Tchaikovsky Violin Concerto like you've never heard before. The Cincinnati Symphony Orchestra presented a new, 45-year-old Russian-Italian violinist named Sergej Krylov, whose electrifying technique in Tchaikovsky as well as in his encore, a Bach transcription, had listeners on their feet twice on Thursday in Music Hall." Midori performed the Korngold with the Pacific Symphony. The Orange County Register: "Midori turned out to be the wrong violinist for the Korngold concerto." May 4, 2016 at 07:39 PM · I have to confess I am puzzled. Was Midori the wrong violinist because she turned up at the wrong venue? Or was she sharing the stage with another soloist and they forgot who was going to do which concerto? Don't tell me this is one of Trumpiverse's Tweets? May 4, 2016 at 08:51 PM · If you click read the rest of the review, she explains in detail. May 5, 2016 at 02:31 AM · "a new, 45-year-old violinist"
Now that's something you don't hear every day.